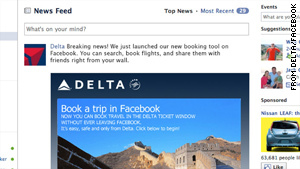 Delta's Facebook page now has the "Ticket Window," allowing users to book travel entirely through Facebook. Atlanta, Georgia (CNN) -- Booking a flight just got more social. Delta Air Lines unveiled a new feature on their Facebook page Thursday that allows fliers to book air travel entirely through Facebook. Dubbed the "Ticket Window," the new tool comes just days after the company gave its homepage a thorough redesign as part of what Delta says is a larger plan to improve the online experience for customers. Delta says other plans include improvements to airport kiosks, and a new iPhone app that will let fliers check in, research flight statuses, check frequent-flier-mile balances, and even set parking reminders. Passengers in certain hub cities will be able to use the app as a boarding pass -- a feature already available on their mobile site. "Unlocking the full power of social media and mobile apps is the next step for Delta, while providing innovative travel tools and greater convenience in our customer's mobile world," said Bob Kupbens in a written press release. The move comes in the midst of an already fiercely competitive commercial air travel market. In May, Continental and United airlines announced a definitive merger plan, making it the world's biggest air carrier -- a title previously held by Delta.